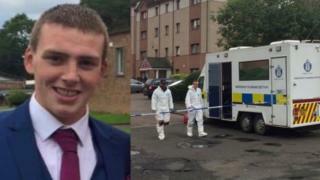 Two teenagers have been arrested following a large-scale disturbance in Glasgow in which one man died and five were injured. The pair, aged 16 and 17, are in custody in connection with an alleged serious assault. The incident happened near a children's play area in Ballantay Terrace in Castlemilk at about 20:00 on Saturday. The men are expected to appear in court on Friday. Earlier police launched a murder inquiry after Jamie Lee, 22, was shot and killed during the incident.